Covers WS-BPEL 2.0, its process structure, standard faults, default attribute values, and all important BPEL activities. 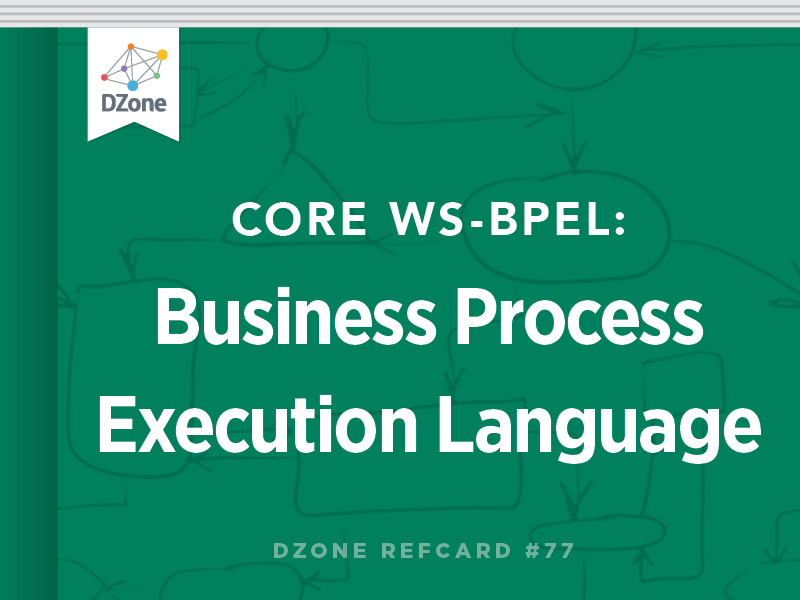 Each BPEL process consists of the following: (a) BPEL code, which defines the orchestration flow; (b) WSDL interface, which defines the interface (and the related XML Schemas) of the BPEL process for its clients; (c) WSDL interfaces of the consumed services (partner links). Partner links define the relations between BPEL process and the web services. Figure 1 shows the overall structure of a BPEL process. Use <sequence> for sequential execution of process activities. Use <flow> together with <links> for concurrent execution of process activities. Characterizes a relationship between two services. We define roles played by each of the services. We specify the used portType of each service within the context of the conversation. Each <role> specifies exactly one WSDL portType. <plnk:partnerLinkType> is defined in the service WSDL document, not in the BPEL. Defines the relation of the BPEL process to partner web services. For request-reply semantics specify both roles, for one-way semantics specify one role only. Endpoint references associated with partnerRole and myRole of <partnerLink>s are manifested as service reference containers (<sref:service-ref>). Declare variables within a process or a scope. Variables hold XML data. Variable can be one of the following types: WSDL message type, XML Schema type, or XML Schema element. Variable is visible in the scope in which it is defined and in all nested scopes. Update and copy data between variables, expressions, and partner link endpoint references. Validates the values of variable against the associated XML or WSDL data definition. For invalid validation, bpel:invalidVariables fault is thrown. Defines a set of activities that will be executed in sequential order. Specifies activities that should be performed concurrently. To define synchronization dependencies between activities within <flow>, we use <links>. This way we define the order of execution. Links have to be declared within the <flow>. Define source and destination links for synchronization of flow activities. <source> is used to annotate an activity being a source of one or more links. <target> is used to annotate an activity being a target of one or more links. A link's target activity can be performed only after the source activity has been finished. Indicates whether a bpel:joinFailure fault should be suppressed or not. When not specified, it inherits its value from its closest enclosing construct. To give a name to the BPEL activity (not related with links). Invokes an operation on a partner link web service. Waits for an incoming message (operation invocation). Typical uses: first process activity (createInstance="yes"); to wait for callbacks. Waits for one of several possible messages (operation invocations) or for a time-out. <pick> can be the first process activity (createInstance="yes", no <onAlarm> allowed). Sends a response for a request-response operation (synchronous). The request is received using either <receive>, <onMessage>, or <onEvent>. Waits for a specified time period or until a certain deadline. Immediately ends the BPEL process instance. This activity does not do anything. It is useful for synchronization of concurrent activities. Used in until expression of <onAlarm> and <wait>. XML Schema date or dateTime types are used to express deadlines (following ISO 8601). Used in for expression of <onAlarm> and <wait>, and <repeatEvery> expression of <onAlarm>. XML Schema duration type is used (following ISO 8601). P Time duration designator. Duration expressions always start with P.
Y Follows the number of years. M Follows the number of months or minutes. D Follows the number of days. H Follows the number of hours. S Follows the number of seconds. To model decisions. <if> selects exactly one activity from the set of choices. Define a loop that repeats as long as the specified <condition> is true. Defines a loop that repeats until the specified <condition> becomes true. The <condition> is tested after the loop activities complete. Loop will execute at least once. Iterates its child scope activities in parallel (parallel="yes") or sequential manner, exactly <finalCounterValue>-<startCounterValue>+1 times. An optional <completionCondition> allows the <forEach> activity to complete without executing or finishing all the branches specified. Defines a nested process scope with its own associated <partnerLinks>, <messageExchanges>, <variables>, <correlationSets>, <faultHandlers>, <compensationHandler>, <terminationHandler>, and <eventHandlers>. Generates a fault from inside the business process. Fault is identified by a qualified name. Rethrows the fault that was originally caught by the enclosing fault handler. <rethrow> can only be used within a fault handler (<catch> or <catchAll>). Define the activities that are performed in response to faults. Fault handler can be <catch> or <catchAll>. They can be defined at the <process> level, within <scope>s, or inline for <invoke>. Allow a process or scope to react on inbound messages (operation invocations) or on alarms. Event handler must contain at least one <onEvent> or <onAlarm> element. It can be defined at the <process> level or within <scope>s. ( messageType="QName" | element="QName" )? Defines activities that are processed for compensation. Can be defined within <scope> or inline for <invoke>. Starts compensation on a specified inner scope that has already completed successfully. <compensateScope> can only be used within a fault handler, another compensation handler, or a termination handler. Starts compensation on all inner scopes that have already completed successfully, in default order. <compensate> can only be used within a fault handler, another compensation handler, or a termination handler. Defines the activities that are performed when a BPEL process is force terminated. Can be defined within <scope>. Used to name message exchanges. Used to associate inbound message activities with <reply> activities (for example <receive> with <reply>). Use only if the execution can result in multiple pairs of inbound message activities and <reply>s. Creates a unique name definition and associates it with an XML Schema type. <vprop:property> is defined in the service WSDL document, not in the BPEL. Maps a property to a field in a specific message part or variable value. <vprop:property> is defined in the service WSDL document, not in the BPEL. Extracts property values from variables. string1 - source variable name. Correlation set is a set of properties shared by all messages in the correlated group of operations within a process instance. Can be declared within a process or scope, or inline for <invoke>, <receive>, <reply>, <onMessage>, and <onEvent>. Correlation can be used on <invoke>, <receive>, <reply>, <onMessage>, and <onEvent>. <correlation> indicates which correlation sets occur in the messages being sent and received. The initiate attribute is used to indicate whether the correlation set is being initiated (yes-initiated, join-initiated if not yet initiated, no-not initiated). Waits for an incoming message (operation invocation). Typical uses: first process activity (createInstance=\"yes\"); to wait for callbacks. Iterates its child scope activities in parallel (parallel=\"yes\") or sequential manner, exactly <finalCounterValue>-<startCounterValue>+1 times. An optional <completionCondition> allows the <forEach> activity to complete without executing or finishing all the branches specified.